Curt Malawsky is usually the one giving out the game balls. After the Roughnecks beat the Colorado Mammoth 13-9 on Saturday, the Calgary coach was on the receiving end of the traditional post-game tribute. Although Dane Dobbie scored four goals and added three assists, the alternate captain realized the Malawsky should be feted for becoming the winningest coach in franchise history. “Dobbie, he gave me the game ball and the guys were pretty excited in there,” said Malawsky, who now has 47 wins behind the bench for the Riggers, which is one more than the late Chris Hall. “When you’re a player and you go to war with the teammate next to you, it’s different than when you’re a coach and you put a lot of time and effort in. Dobbie, who also surpassed the 700-point plateau late in the game, was happy to present his coach – and good friend – with the game ball following Calgary’s second straight victory. “It’s awesome,” Dobbie said. “That guy is a warrior. He coached me in junior (with the Coquitlam Adanacs), I got to play with him in pro and senior and he’s coached me ever since. When Dobbie was just in his second NLL season in Calgary, Malawsky was still the master of the quick-stick goal for the Riggers. As teammates, the two heart-and-soul players helped Calgary win the 2009 Champion’s Cup, after which time Malawsky retired and accepted a job as an associate coach with the Riggers in addition to holding down the titles as offensive coordinator and assistant general manager. The man they call ‘Mouse’ took over the coaching reigns of the squad in 2013 and hasn’t looked back since. 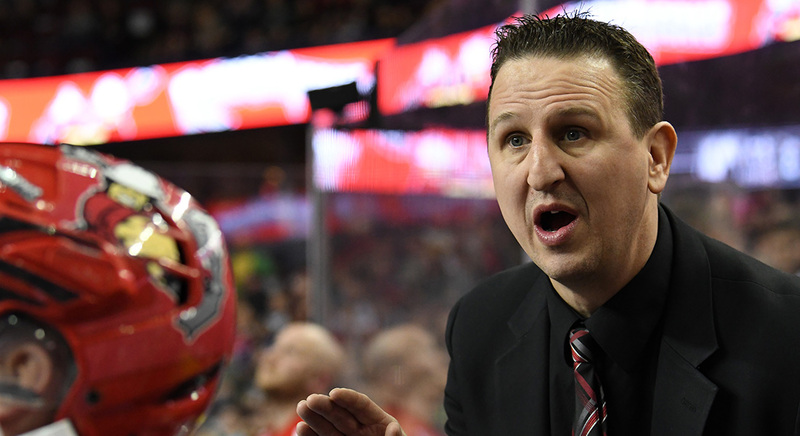 “I guess when you hang around long enough, you eventually get something like that,” said Malawsky of surpassing Hall to become the franchise’s all-time wins leader among coaches. “It’s very special, not only to be in the company of Chris Hall and some of the great coaches throughout Roughneck history, but I think just being part of this organization means so much to me that it’s just a real special honour. Even in front of the assembled media asking him questions about his numerous accomplishments, Malawsky was humble, sincere … and even a bit emotional.